This story was written by Andy Barr. While John McCain's past battles with skin cancer has received a great deal of scrutiny, Joe Biden's near-fatal aneurysms in 1988 have yet to come under the spotlight. Following the memorial service of Rep. Stephanie Tubbs Jones, who died in August of an aneurysm, Biden said, "I know it sounds corny, it almost sounds maudlin, but you know, here she was one day walking around, just like I was the next day. "I woke up four hours later on the floor with a hemorrhage. In her case, the same thing happened, only she never made it back." Dr. Anthony J. Caputy, chairman of the neurology department at George Washington University Hospital, said that after being treated for the aneurysms, Biden is "highly unlikely" to experience the problem again. "Once they're dealt with, they're dealt with," Caputy said. "The likelihood that he would ever have any trouble is very small, even smaller than the general population." 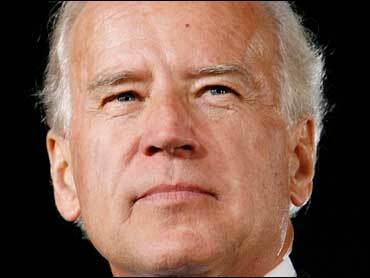 Biden's spokesman David Wade told Politico that "we intend to make available his medical history before the election." Like Biden, McCain's running mate Sarah Palin has not yet released her medical records. Spokesman Ben Porritt said only "we have no announcement at this time." McCain, who is four years older than Biden, provided access to nearly 2,000 pages of his recent medical history in May following questions about his history of melanoma and concerns about his age. On a conference call with reporters following the release of McCain's medical records, the senator's personal physician, John Eckstein, said, "Sen. McCain enjoys excellent heath and displays extraordinary energy." Still McCain's health has been an issue, especially after selecting Palin as his running mate. Democrats frequently questioned her experience by pointing out that if elcted, she would be "a heartbeat from the presidency," a thinly veiled shot at McCain's age and previous medical concerns. Soon after the Palin pick, top Barack Obama surrogate Sen. Claire McCaskill (D-Mo.) invoked McCain's history of skin cancer on ABC's "This Week," telling host George Stephanopoulos, "I think what we're talking about is a reality. Other people talk about his melanoma. We're talking about a reality here that we have to face. This is someone who's going to be one heartbeat away from the presidency. All of us know it. I just think that it's the facts." Obama released a brief letter summarizing his medical history shortly after McCain made his medical records available. The summary, written by Dr. David L. Scheiner, revealed that Obama had struggled to quit smoking but is overall in "excellent health." The line most media outlets seized on from the summary is that Obama is "lean and muscular with no excess body fat." While the short letter released by the Democrat's campaign praised his diet and fitness regime, the full disclosure McCain provided opened him up to some embarrassment. One note in a report from McCain's oncologist, Dr. Suzanne Connolly, drew particular interest: "Buttocks unremarkable except for some very light tan freckling."